January 26, 2018 – NASA’s Global-scale Observations of the Limb and Disk, or GOLD mission launched at 3:20 p.m. MST, Thursday, January 25, as a commercially hosted payload on the SES-14 satellite. 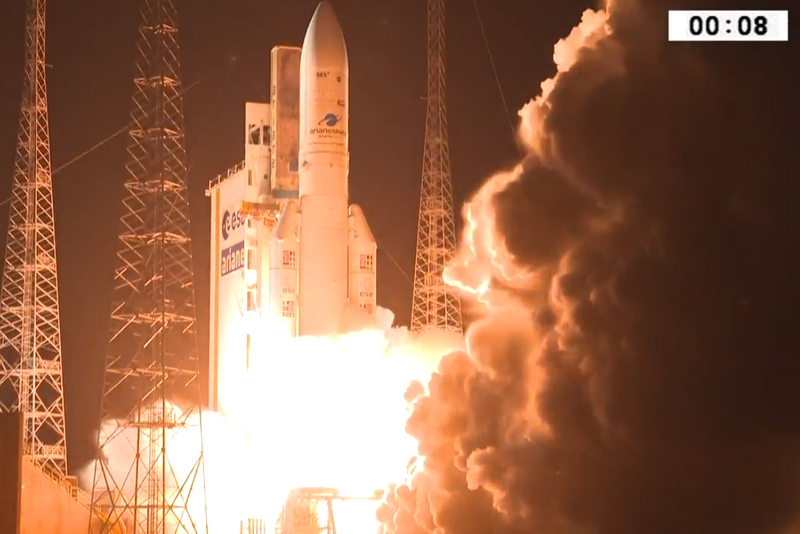 The satellite was launched on an Ariane-5 rocket from the Guiana Space Centre in Kourou, French Guiana. A few seconds after the upper stage ignition, a second tracking station, located in Natal, Brazil, failed to acquire the launcher telemetry. The lack of telemetry lasted throughout the remainder of the powered flight, leading to speculation that the rocket and payloads might have been lost. Scientists and students at the University of Colorado’s Laboratory for Atmospheric and Space Physics, where GOLD was built, waited for a status update. Following the launch anomaly, SES established a telemetry and telecommand connection with the satellite and determined there was minimal impact on the SES-14 satellite, or the GOLD instrument. SES confirmed the spacecraft is in good health, all subsystems on board are nominal, and the satellite is expected to meet its designed life time. An orbit-raising plan has been established to place SES-14 in geostationary orbit only four weeks later than originally planned. In a statement from NASA, the agency said that science operations were originally expected to start in mid-October and that they are still working to maintain that timeline as closely as possible. The Al Yah 3 satellite, which shared the launch ride, is also communicating with its command center and will continue its mission.